Gary and Stacie May head a Colorado farm family and have lived on their farm since 1988. Both Gary and Stacie’s roots lie in the country and they have raised their children with the same rural values based around hard work and perseverance. Together they have six children, four of whom have graduated from Colorado State University in Fort Collins, and two who still attend the local High School in Byers. Both Gary and Stacie are very involved in the community through many different community organizations, church and school. 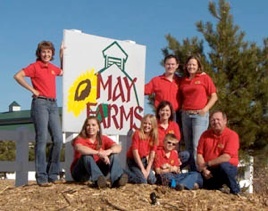 Gary and Stacie developed May Farms into an Agri-tainment enterprise to be a quality leisure destination providing memorable family, educational and recreational experiences. Agri-tainment turns a working farm into an adventure for others. It provides a glimpse of rural life and a farm experience to those who would otherwise not have the chance. Not only does Agri-tainment allow the May Family to share their heritage with other families, but it presents the family with the opportunity to revive and preserve a rural community. 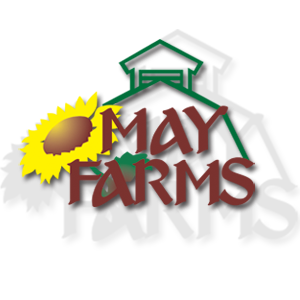 May Farms is unique because it is a working farm operated by the family and is in the path of growing metro-Denver. Development and growth threaten the farmer’s ability to predict the future or assure his family that the land will pass to the next generation. As the family still depends on the crops they produce from farming for their livelihood, by offering their farm as an Agri-tainment venue they are able to ensure the preservation of their farm and keep the tradition of passing the farm down for generations to come. The farm is still run by the family including all six children. You are sure to meet at least one family member on your trip to the farm which they call their home!